YES, well I remember that trip, SIR BUG KILLER himself brought BIG BUG TAILS for all. Juicy and sweet were they!!! Jim the freaking Galapagos would be on my bucket list, but I heard it is all a preserve now. I do not know if fishing is even alowed. Are you all planning a trip to the freaking Galapagos Islands? Paved road, plenty of gas stations...beautiful location with lots of chrome eating fish in Mexico. Cook on your night. Bring ice. Enough said. Hashem, I know how you feel, tomorrow is Friday and Rob and I will be getting there before dark, and just in time for dinner. That will give us Saturday to work on the place and get a little fishing in before heading back Sunday morning. So tonight is my Friday night and I might not sleep as I get SO excited, even if I go there every week. This place is MY Disneyland, and just for you I asked the big guy to stock fresh fish this week!!! It's funny how we have been there so many times and yet I feel the same way. It will be hard to sleep tonight! See you tomorrow bud! I guess thats what happens as you realize your dreams. Plywood, 2x4's, picture window and siding are going down for Rob's and my place, enough to finish the front. Also going is an 8D deep cycle battery to get the solar system for OUR PLACE to be known as ""Sueno del Mako"" or in english "Mako's Dream" up and running with power. I have one more battery but it will have to go on the next trip. This one lets me test the system and Sven will do the installation this coming week. Hopefully it will be up and running for the October trip starting on the 17th. That way we can charge electronics during the day and evenings too. Tight Lines all. Have a safe trip to and from, and let us know how it went. Be sure to wear eye and ear protection when working with power tools. SAFETY should be job 1. Ok Monstahfish and I are all set. We got our FMMs taken care of today. It was about an hour wait today by car to come back. Now if it had said A twisted road, that would have been something. Last edited by Mahigeer; 10-10-2015 at 06:20 AM. Too bad it's paved the whole way. I'm looking forward the the photos and videos of everyone having fun. Defjack is getting his FMM today at the border today. I doubt any bait or otherwise fish in Gonzaga Bay would look like these flies, but I thought I will give them a try. It is more satisfying to catch a fish with a fly that one ties after all. I am almost done packing, but some addition of accessories to the kayak remains. It should be done tomorrow. I may even take out for a lobster hooping trip before our trip. Just back from paradise, passed Danny on the road as we were coming back. They will do good. Water was nice. Temps were good but still warm. 90's but LOW humidity so not too bad. Sven and Steve took Rob to the deep reef in Gonzaga. I will let Rob tell the rest of that story. BRING WIRE and SMALLER jigs, fish are targeting 1-2" bait. TON'S of Sierra, lot's of Corvina, bass, triggers, rose snapper. small mega baits but BEEF up all the small hooks. OR YOU WILL LOOSE FISH, some of them BIG fish. BIG fish just love to straighten out those small trebles. In SIX days those going will catch. Welcome back. That was a short trip. Did you get any work done, or just dropped off the material? Great to hear the fish are there and biting. I don't know if I could use metal leader on the fly rod? I will call a fly shop. Thanks for the tip on hook replacement. Hashem it is YOUR outfit. JUST DO IT, your worry would be to damage your rod tip if you were to hit it, and your fly has a small piece of lead so it could damage your rod. I was fishing a deceiver years ago and had it happen, but it is not something that would normally happen. I do not worry about it. With sierras you will be cut off a lot!!! They are everywhere now to over 32"'s. 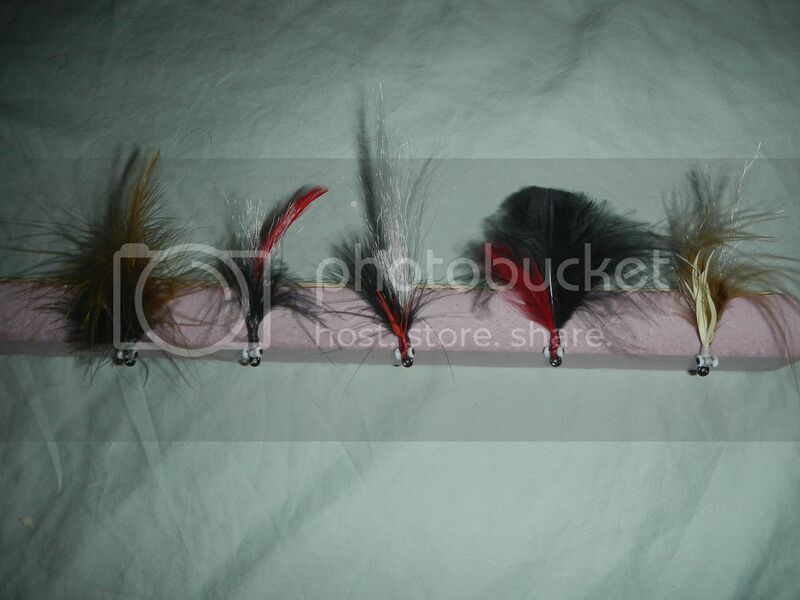 Short 6" wire will work and BTW put anything SILVER or FLASHY as part of your fly. They will ALL get bit but............................................... ......Flashy is better, the bait is silver, (match the hatch). Tight lines, fishy dreams. All your flies will get bit, lighter colors with flash or silver normally work better. 6" wire leaders will save flies and jigs. Plastics also work well BUT you have to move them faster or the triggers will tear them up. If you are getting lots of triggers MOVE your Jigs FASTER. Works for me. Tight Lines and fishy dreams. We will be meeting at Johnnys Shell station in El Cajon at 5 am. Address is 515 N. Magnolia Ave, just off the 8? YES, Jeff 5am Saturday morning, it is POSSIBLE I will be a few minutes LATE as I am loading TWO new guys that morning, but I will be there. Jeff you know how hard it can be to get loaded when there are going to be three of us all trying to get ALL our gear on board. Gr8fulDude will be coming in on Friday night and loading his stuff, then sleeping in his car until morning. Do not know when Hashem will arrive, hopefully by 3 so we should be on time but you never know. My plan was to leave LA around 8-10:00 PM on Friday. Take the (15) freeway. Hit the Pechanga Casino for several hours, and then it is a 45 min. drive to Bob's place (according to Google Maps) and arrive to his place by 3:00 AM initially for the 3:30 AM rendezvous. Since the rendezvous time was changed to 3:00 AM, I was planning to adjust my arrival. I could also take (405) freeway come directly, to Bob’s place if that is a better plan and after loading, do something around there, or go to Pechanga afterwards. I don’t know how much useful sleep I could get in the car. As to loading the truck, I think all of the gear should be present, so the heavier/sturdier ones are on the bottom. Like my Yeti cooler and the Rubbermaid Actionpaker’s containers. I have a roof carrier that in Lieu of Bob’s kayak could go on top. The light but bulky items like sleeping bags could go in there. I will have extra straps with me if needed. I am available to suggestions. If you are at my place at three it will all work out fine. Remember my rack holds two yaks, yours and Gr8fulDudes. Should be good. Jeff sent a pm and this was my reply. We all know where we meet at Johnny's shell station? From there we will put those needing FMM"s or need them stamped in one or two trucks. Those trucks will do a left at border check to get FMMS the others will go right and line up there before the light on RIGHT side. When we come out of FMM PLACE we will get in right lane and you will follow us, stay close. I will keep the speed down so you can keep up. Go to all things Baja or Bust STICKY THREAD and print out the driving directions JUST INCASE. Once out of Mexicali I will stop at a PEMEX STATION on the right side of the road to get us all together again. FROM Samn Diego to Mexicali is 125 miles we can stop there for fuel if needed. Then from there to San Felipe is another 125 miles. EVERYONE will fuel up there. Then 95 miles to camp.